Is EZ Vinyl/Tape Converter supported on my computer? How do I get the latest version of the EZ Vinyl/Tape Converter software and install it? How do I use the EZ Vinyl/Tape Converter software? How do I import my converted songs into iTunes? My sound is distorted or does not sound right. How can I fix this? I have no sound. How can I fix this? The software is unable to connect to the audio device. What should I do? Why does my record or tape player work on one USB port and not another? The software is asking me to install iTunes. Why? The software is asking me for a 64-Bit version of iTunes. Where do I hook up the RCA connections on my computer? I am only able to record in Mono. What should I do? Why can I hear my own voice on my recordings? The song is skipping and repeating while recording. The track count of my album is incorrect. I am only able to record for one minute. What should I do? All of my files are named 'temp'. How can I fix this? I am unable to export to iTunes. What should I do? 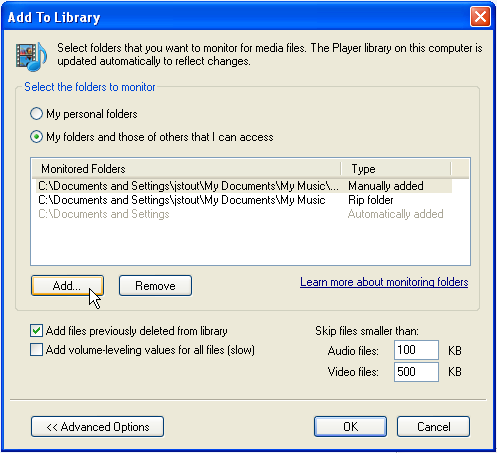 Can I add my music to Windows Media Player? What do I do if I am getting echoes in my recordings or doubling of audio? iTunes keeps alerting me it is not the default media player. How can I add my converted MP3’s to a non-iPod MP3 player? I cannot find my music in iTunes. My audio tracks have been imported into iTunes. Where did they save to on my computer? 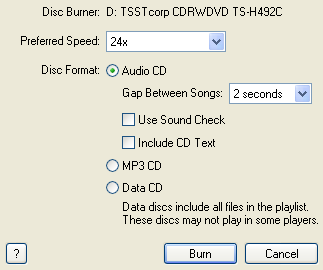 How do I burn my converted music to audio CD? How do I convert my 78 records? My USB cable is not working. What type of cable does my product use? How can I add or change track information associated with my converted MP3’s? How can I get additional assistance with my product? I need warranty service. Who do I contact? Our The EZ Vinyl/Tape Converter (included with your ION turntable or cassete player) is used to transfer your music to the computer and automatically split the songs up accordingly. Once you have your songs saved to your computer, you can use a software like iTunes to organize them and convert them to MP3. Even if your ION turntable or cassette player came with an installation disc, we recommend visiting our website to make sure you're getting the latest version of EZ Vinyl/Tape Converter. Note: The latest version of the EZ Vinyl/Tape Converter for Mac automatically imports your converted albums into iTunes. Earlier versions of the Windows edition of the EZ Vinyl/Tape Converter software required iTunes to be installed on a Windows computer. 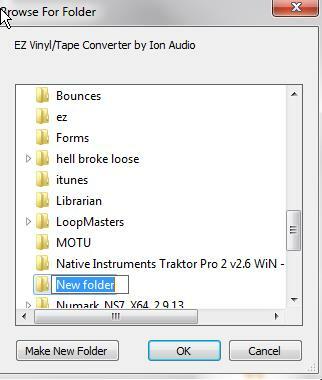 Make sure you are using the latest version of the EZ Vinyl/Tape Converter which can be installed and downloaded from this link. The following video walks through the Windows process of downloading, installing, and using the EZ Vinyl/Tape Converter, as well as importing audio tracks into iTunes. Follow the steps below to update both iTunes, and the EZ Converter software. Download the correct version for your Operating System. Save it to your computer. Once the file has downloaded double click the file to begin the installation process. Follow the prompts, and finish the installation. Upon completion of the installation you should now have an icon on your desktop. If you already have iTunes installed on your computer you can update the software from within iTunes. Please note that iTunes is not required to use EZ Vinyl and Tape Converter on Windows. Apple will automatically detect your Operating System. Click the download link. Save the file to your computer. Once the file has downloaded double click the file to begin the installation process. Follow the prompts, and finish the installation. Upon completion of the installation you should now have an icon on your desktop. If you are having difficulty exporting to iTunes click here for help. When connecting the device to your computer you will only need to use the USB cable and not the RCA connection. All of the sound is transmitted through the USB port so the RCA connection is not required. If your ION Audio device came with a wall adapter plug it in to an electrical outlet. Note: Some devices are powered by the USB port on your computer, and do not require this connection. Plug the USB Cable into the ION Audio device, and then directly into a USB port on your computer. 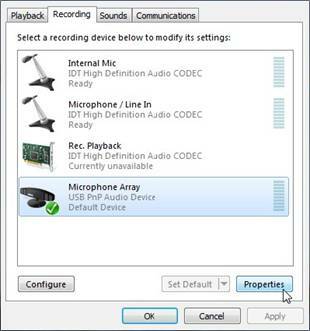 If the software is unable to connect to the audio device try different USB ports on your computer until the device is recognized. Make sure you are going directly into a port on the computer and not through a USB hub. If you have tried all available USB ports, and the software is still unable to connect to the audio device try switching the USB cable. See more on cables here. Setting up the sound correctly can help resolve many common issues experienced during playback. Some of the more common issues include: No Sound, Distortion, and Mono Playback. Some turntables ship with a protective cover to protect the needle. Make sure you remove this before trying to play the turntable. The Turntable will show in your computer as one of the following USB Audio Codec/PnP Audio Device/Microphone Array. We want to make sure this is not the default playback device. We do however want to use this device for recording. Make sure all other programs are closed while making changes to sound settings. Your turntable or cassette player will need to be plugged in while making these changes to your sound settings. Below are setup instructions for Windows 7/8, Vista, XP, and Mac OS X. In the lower-left of your screen, click Start button . In the window that opens, click Sounds, Speech, and Audio Devices. Choose Sounds, and Audio Devices. This will open the Sounds and Audio Devices Properties. At the top of the window, click on the Audio Tab. 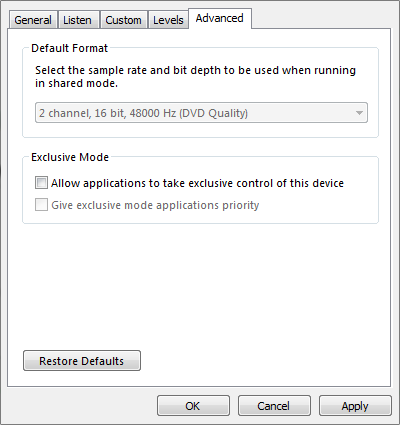 Under Sound Playback Default Device, choose your sound card. 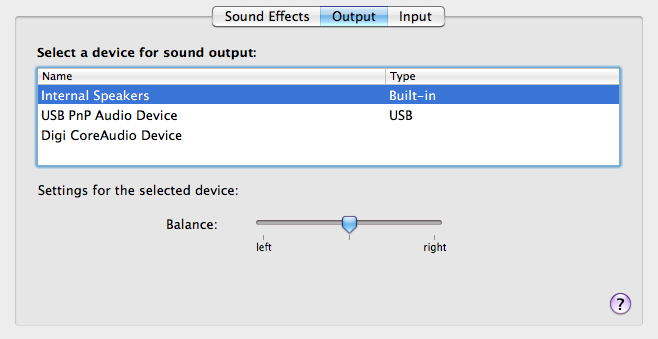 Under Sound Recording Default Device choose the USB Device. Do not make any changes to MIDI Music Playback Default Device. Next, click on the Voice tab and mirror these settings. Click Apply to save, then click OK to exit. Click the Start button on Windows Vista and Windows 7. For Windows 8, see below. 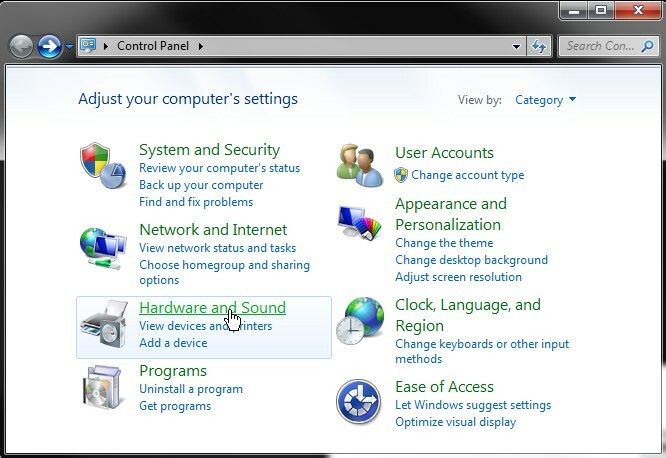 Note for Windows 8: Open Control Panel by swiping in from the right edge of the screen, tapping Search (or if you're using a mouse, pointing to the upper-right corner of the screen, moving the mouse pointer down, and then clicking Search), entering Control Panel in the search box, tapping or clicking Apps, and then tapping or clicking Control Panel. Double-click Hardware and Sound it may only say Sound. Double-click Sound, the Sound Settings window will open. Under the Playback tab click on your sound card speakers. Click Set Default at the bottom of the window. 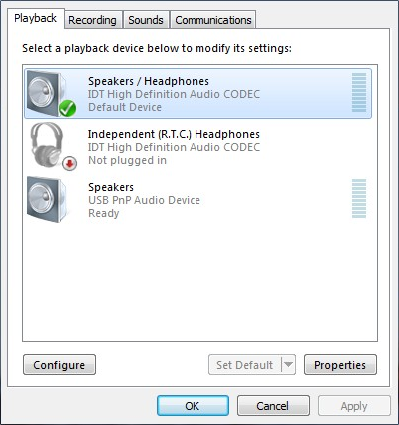 IMPORTANT: Make sure the USB Audio Codec/USB PnP Audio Device is NOT your Default playback device. Click on the Microphone Array (USB Codec, PnP). Click Properties on the bottom of that window. 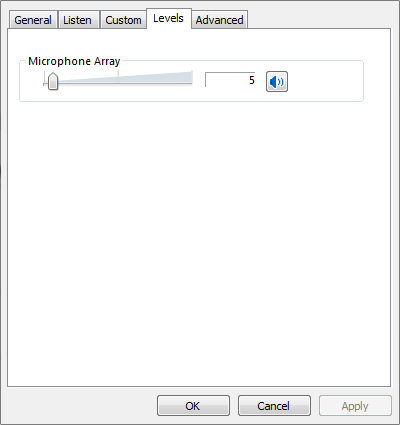 Microphone Properties window will open. See figures below. Set the level as close to 5 (Windows 7/8) or 25 (Vista) as you can, The microphone is very sensitive and needs be set this low to avoid distortion. Set the Sample Rate to 2 Channel, 16 bit, 44100 Hz or 44800 Hz. Uncheck both Exclusive Mode boxes. Click Apply, then OK to exit. In some cases a restart is required for the level to save at 5 or 25 depending on your Windows version. Click the Apple icon in the top left corner of your computer screen. In the window that opens, See Hardware, and click Sound. At the top of the new window that opens click on the Output tab. Click on Internal Speakers to set this as the default. 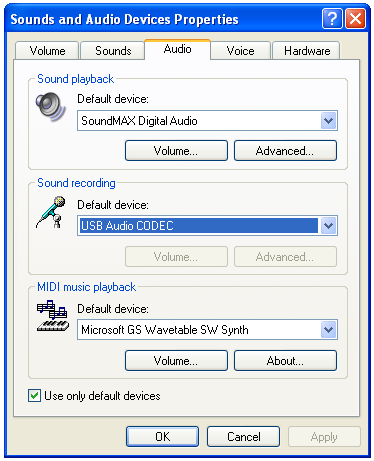 Click on the USB Audio Codec/PnP Audio Device to set the default (Adjust the Volume to desired level). Note: If Line in or Internal Microphone is selected as your default you may hear your voice during recording. The latest version of the EZ Vinyl/Tape Converter for Macs automatically import the converted audio into iTunes, while the latest version of the EZ Vinyl/Tape Converter for Windows allows you to save your audio directly to your computer to any location that you choose. Windows users can then import the audio tracks into whatever audio software you choose. All of the steps and windows are the same for both a Mac and a Windows computer minus the very last step where a Windows user will choose a location for the audio track and a Mac user will automatically have the audio track convert into iTunes. The following steps walk through the process on a Windows operating system. First, connect the ION turntable or tape player to the computer with the USB cable and ensure that it is powered on. Next, open and run the EZ Viyl/Tape Converter software. A window that says step 1: get connected will open up. Press Next. In step 2: Get the music ready to play, there are two very important items that can greatly affect your recordings: GAIN and the Split recording into tracks. 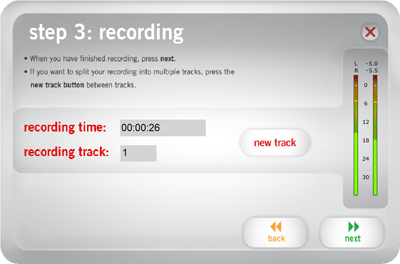 The second item is the Split recordings into tracks feature. When this box is checked off the software will automatically advance the recording to the next track when it detects 4-6 seconds of silence This option can be toggled on or off. Note: This feature may not function properly on certain types of recordings such as spoken word, live recordings, and classical music. Songs with break downs and gaps of silence could trick the software into thinking the track is over and advance it to the next song prematurely. In this case is it best to un-check the box and record the songs manually. Once the GAIN is set to the proper level and you have toggled the Split recordings into tracks function on or off, click on the record button to start recording your audio. When the recording is complete, choose next. Then name the Artist, Album, and Track title in the appropriate locations. By default the audio recordings are saved to the Music folder. If you wish to save them in a different location, such as your Desktop for example, here is how. Highlight Desktop then click Make New Folder. Name your folder, then click OK. Now by default all of your music will be recorded into that folder. The EZ Converter software tries to make the recording of your Vinyl and Cassettes as simple as possible. Let’s take a moment to understand a few features of the software. The EZ software allows the ability to automatically create new tracks. How this works is the software listens to the silences and reads them as a separation between tracks. This is not a perfect technology. Sometimes within a song there is a silence before the track has ended. The software may think this is the end of the track, and split the track. In other instances certain records may have songs that overlap or blend into each other. The software then has a difficult time separating the two tracks. The end result is multiple tracks merged into one track in your final recording. Some instances your recording may only record for 1:00 then stop. This is also corrected with the solution below. 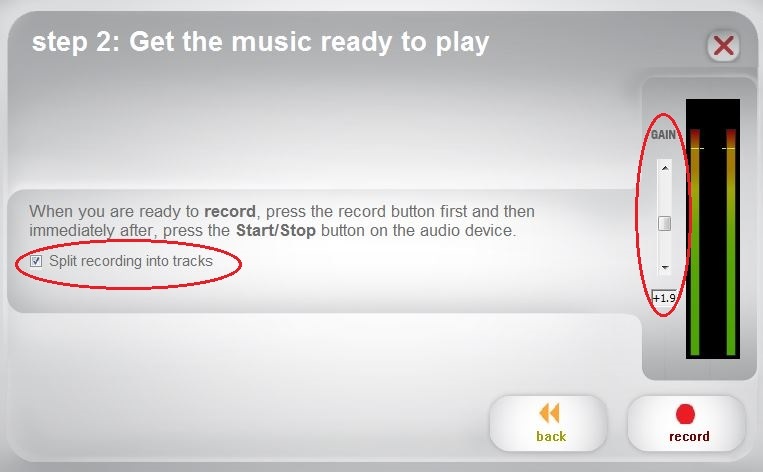 To remedy these problematic albums it is recommended to un-check the box in Step 2 Split recording into tracks. In Step 3 there will be a new track button you can press each time you want the software to create a new track. The recording process will continue, as you split the tracks. This is the most accurate way to record. If you do not click new track, the result will be one long continuous track. Once you have recorded your songs Step 4 will allow you to name the Artist, Album, and the Track titles as well as select your save location. The tracks in white are tracks that the software recognized. 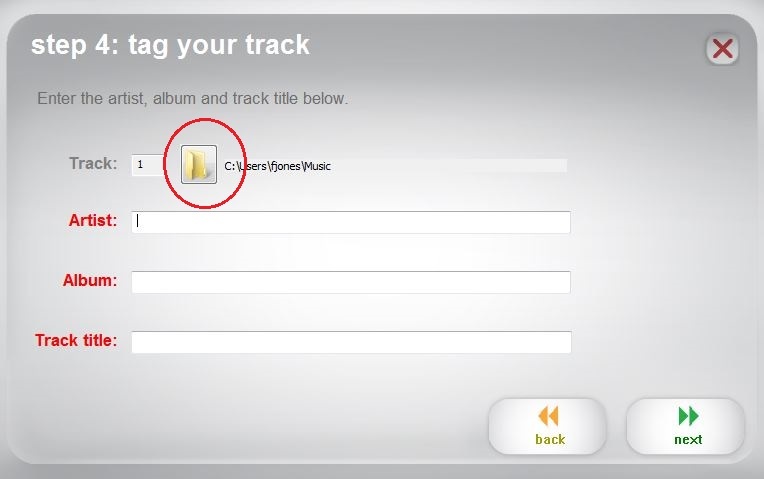 If the tracks are not able to be entered or grayed out then the software did not detect or split the tracks correctly. Refer to the Split Track Function to correct this issue. Windows users: Click on the yellow folder icon at the top of the window to change the save location of your tracks. Select the location where you want to store your files and click Ok to confirm your choice. Currently the only way to record both sides is two record one side, name your tracks, and then export the recording. After the files have exported you will need to start back at Step 1 to record the other side of your album. You can change the track numbers or add information to the file after importing the files to iTunes. See more on adding or changing track information here. To import your audio files into iTunes, the simplest method is to drag your songs directly into the iTunes window or onto the iTunes icon. Click on File in the upper left hand corner of iTunes. 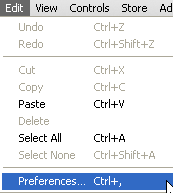 If the File menu is not there press CTRL + B at the same time and the menu will appear. 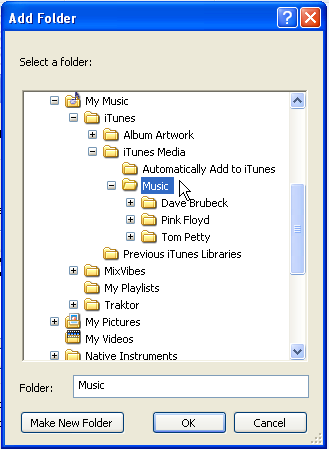 Navigate to the file or folder which contains the songs you want to import and then click Select Folder. Click on USB PnP Audio Device and then click on Properties. A new window will open, click on the Listen tab. Uncheck Listen to This Device. iTunes is a free software that allows us to playback music on our computer. It also allows the ability to add music to portable devices, and CDs for listening to on home and car stereos. Why iTunes? iTunes takes all of the recorded music from your favorite Vinyl or Cassette and converts it to MP3 format. Even if you don’t have an iPod device iTunes conveniently stores the MP3’s on your computer’s hard drive so you can add them to your other portable MP3 device. See Step 8 below for the location of these files. 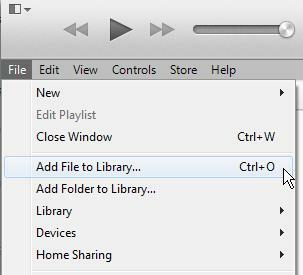 Once iTunes is installed it sometimes will request to be the default player on your computer. This is not required to work correctly with the EZ Converter software. All it is asking is if you want iTunes to open when you double click on your MP3 files. If you wish to use iTunes as your default select MP3 from the list and click OK. There are a number of settings in iTunes that may help to eliminate any potential difficulties during importation. The steps below are what we consider the best settings for using the EZ Vinyl/Tape Converter to convert audio to your computer and then import into iTunes. Before adjusting the settings please make sure you have the latest version. See more on updating here. Click the Edit menu at the top of the iTunes window. 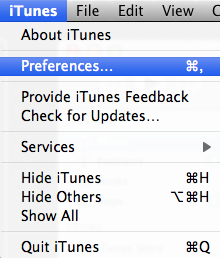 (Mac users click the iTunes Menu). Select Preferences from the drop down list. In General tab window click Import Settings. Make sure MP3 Encoder is selected as your format. Set the Quality to 192 kbps. 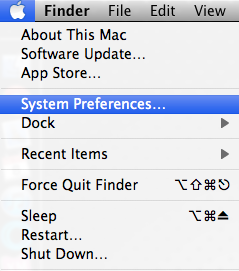 Click on the Advanced tab at the top of the Preferences window. Make sure Keep iTunes Media Folder Organized, and Copy files to iTunes Media folder when adding to library boxes are checked. The iTunes Media folder location is where your music is stored on your hard drive. 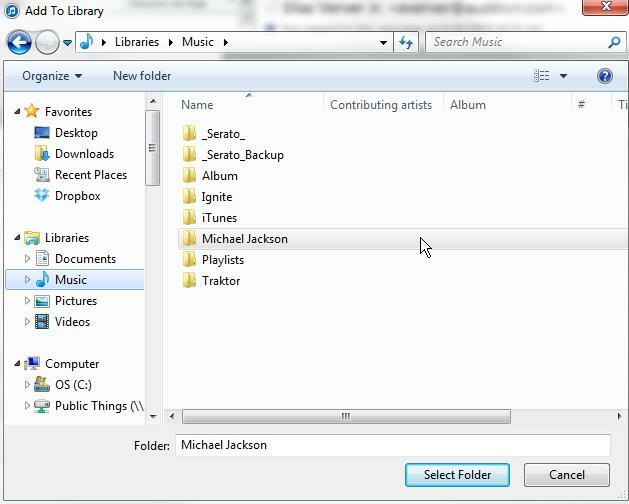 If you wish to add your files to Windows Media Player or a MP3 player you can import your files from this directory. Click on the Recently Added playlist on the left under PLAYLISTS. If you do not have this playlist we can easily create one with a few simple steps. In the selected by drop down select most recently added. Check the box Limit to and set how many files you want to show in this playlist. Check the box Live updating. Click OK. You will now see the untitled playlist. Rename untitled playlist to Recently Added. You now have the playlist to easily find all of your most recent conversions. All of your most recent recordings will automatically appear in this playlist. With iTunes open you have the ability to change additional information associated with the MP3. Simply find your track in the iTunes library, right- click on the track(s) you want to edit and choose Get Info from the drop down list. A new window will open. Click on the Info tab you will then be able to add or change additional information associated with your MP3 including Name, Artist, Year, Album, Track Number, Composer, Genre, and more. Open iTunes by double-clicking the icon. Click File and select New Playlist. 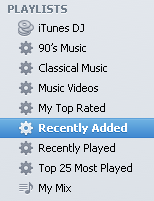 Alternatively you can click the + symbol on the bottom left to create a new playlist. Rename your untitled playlist to whatever you want to call your CD. Click on Music under the Library on the left. Find the music from your collection you want to add to your CD. Click and hold the left mouse button on the desired track(s). Drag the tracks onto the playlist you just created , and your files will be added. Repeat the step 5-8 until you have all of your tracks. Right-click the playlist you created. Select Burn Playlist to Disc. Note: Audio CD is selected as it is the most compatible type to play in home stereo and cars. Also make sure you are using CD-R as they are the most compatible media. Click Burn to start the process. 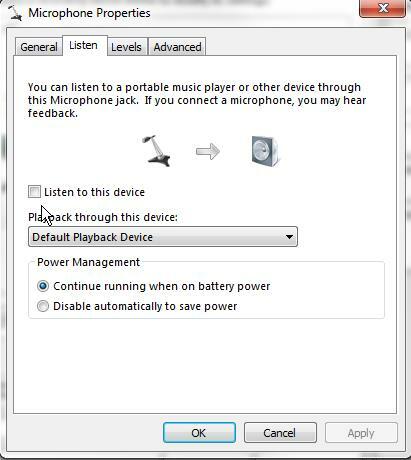 The following steps will show you how to add your converted music to Windows Media Player Library. This way you can add your music to your non iPod mp3 player. Record your music with EZ Vinyl Tape Converter. Save the audio tracks to a location of your choosing on your computer following the steps located here. Once the Add to Library window opens, click Add... from the left. When the Add Folder window opens, find the folder that contains your audio tracks. 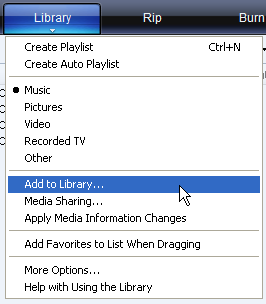 After you have selected the correct location, click OK.
Windows Media Player will now search in the chosen directory for music to add to the Windows Media Player Library. Your converted music will now be available in your Windows Media Player Library so that you can add them to your mp3 player. On a Windows operating system, iTunes versions 11.0.3 and higher do not allow for automatic importation of audio files. 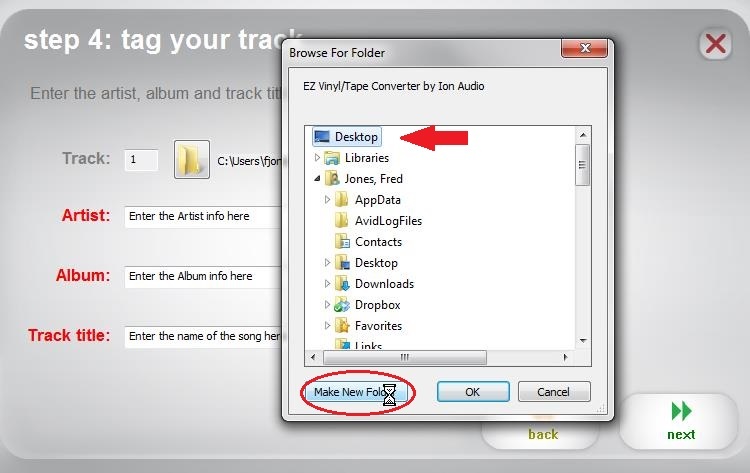 For customers who have already updated to iTunes 11.0.3 or higher, there is now a version of EZ Vinyl/Tape Converter available at http://www.ionaudio.com/ezvc/# that will allow the files to be saved directly to a folder location on your computer rather than exporting directly to iTunes. To update your software, simply visit the link above, and then download and install it. No need to uninstall any prior versions of the software first - it will automatically update. For a video walkthrough of the process of downloading and installing the EZ Vinyl/Tape Converter to your computer, check out the video here. ION Audio Turntables and full sized Cassette Decks use a standard USB A to B. This connection is the same as a USB printer would use. The smaller ION Cassette Players use a type A to Mini B USB cable. Some of the ION Audio turntables offer 78 rpm so the following steps will not be necessary. For all turntables without 78 rpm setting you will need to use a 3rd party software to convert your 78's. Audacity is a free third-party recording software that allows you to adjust the timing of the recorded audio. Audacity is not included with ION products, and technical support or assistance on how to use Audacity is not available directly from ION. Audacity is available online for free from the developer’s homepage. Once you download and install the software follow these simple steps to convert your 78’s. After you have recorded the album, open the Edit menu then click Select and choose All. Next, open the Effect menu and choose Change Speed. Select the speed that you recorded it at (33 or 45), as well as the speed you would like it to be (78). All other information on how to use the Audacity software is available on their website. If you are experiencing looping or audio skipping please try the following recommendations.